This post is sponsored by Ingredients by Saputo. The opinions on this blog, as always are my own.You can follow Ingredients by Saputo on Facebook, Instagram, and Pinterest for more recipe inspirations. Thank you for supporting the brands that keep me baking! Spring is here!!! And that means fresh flavours and so much inspiration...I can hardly wait! 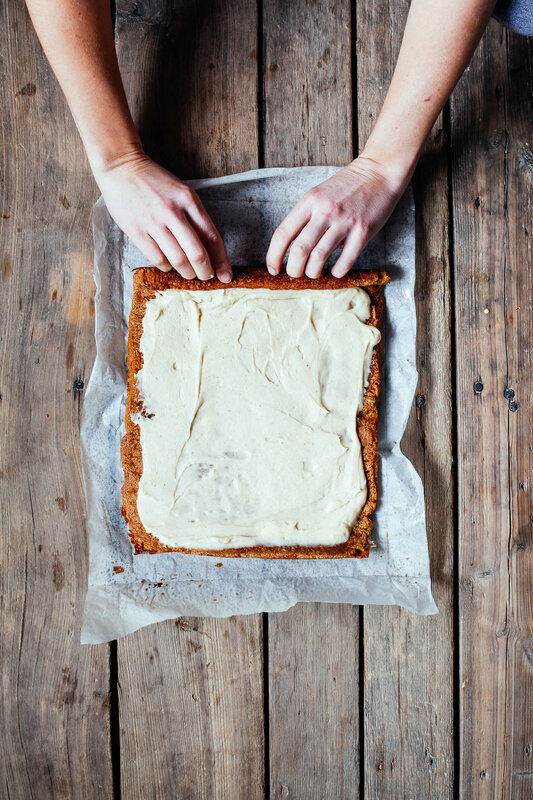 Today we are talking about carrot cake. 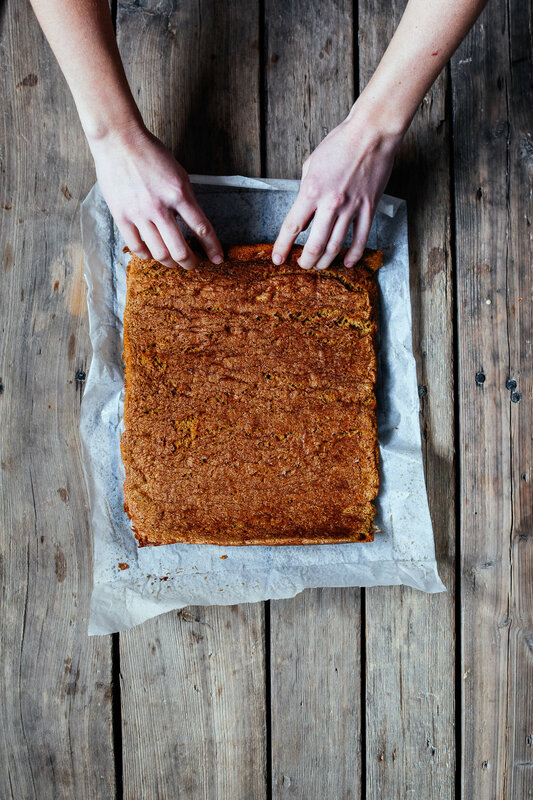 Not just your average carrot cake either. Nope. I am so excited to be working with Ingredients by Saputo again, and we’re putting a fun spin on classic flavours, and I hope that you’ll be brave and jump into it with me! Now, it’s important to note that while this cake is quick to whip up, there is a ton of waiting time. 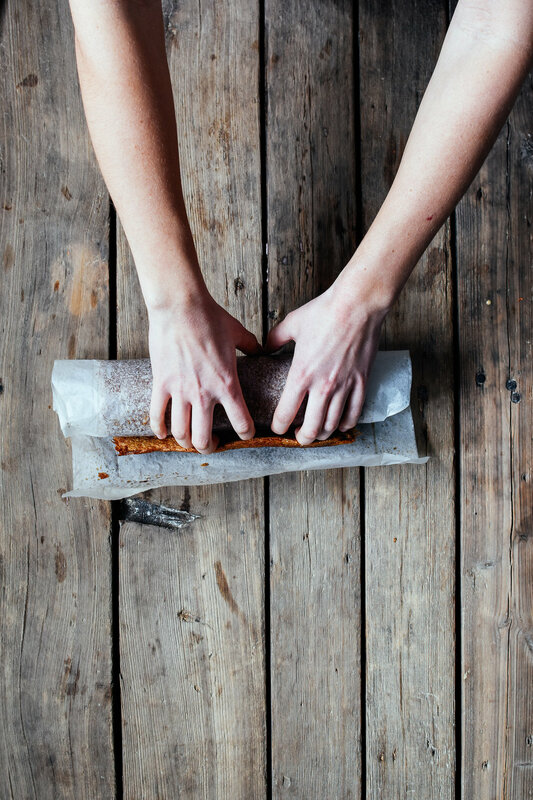 Once the cake is baked, you roll it up while it’s still warm, and then let it cool completely. And I do mean completely. If you try and frost it while it’s even a little bit warm…you’ll end up with melty frosting that smooshes out of the roll! 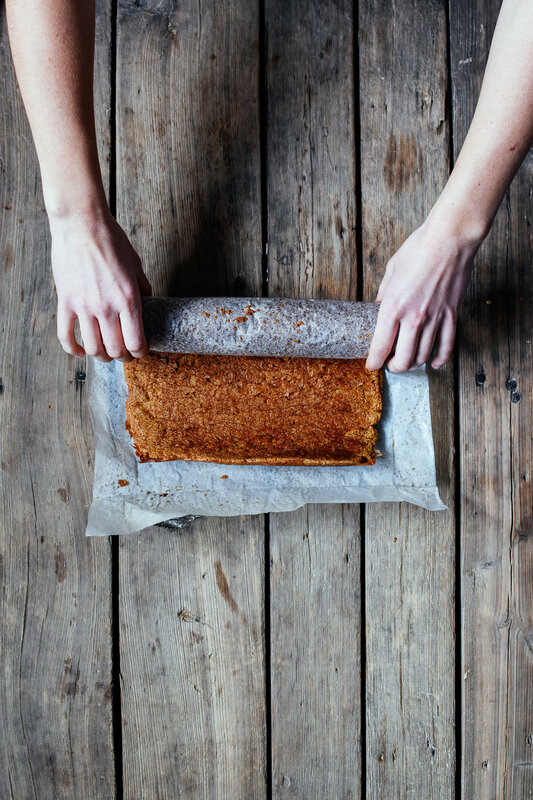 I roll my cake up with the parchment paper that I bake the cake on so it’s nice and easy! (sidenote: I’ve seen some people use towels, or even those “bake and roll” mats, but I find this method to be the easiest for me! And it never sticks....hurray!) This is so that you’re able to unroll it gently, fill it with frosting, and then roll it back up without it cracking! The cake will then need to set in the fridge for at least an hour or two before you can serve it. It’s a great cake to make the day before, and simply keep in the fridge before you’re ready to serve! Then you can place it on a serving plate, dust with powdered sugar, add garnishes if you’d like, and voila! Also important! The ends are always a bit rough, so I like to trim a thin slice off of each end before plating the cake up, so the swirls really shine! (And then you can have a little sample of it too test too...so that’s a win win!). Note:The size is very important, as using a larger or smaller pan here will greatly affect the thickness of the cake, and likely won’t turn out well. In a large bowl, mix together eggs, brown sugar, and vanilla extract on low speed until just combined. In a separate bowl, whisk together all the dry ingredients. Add the dry ingredients to the wet, and mix together on medium speed until ingredients have just barely incorporated. Use a spatula to scrape down the sides and bottom of the bowl to ensure everything is mixed in. Pour the batter into the prepared pan, and spread into an even layer. Bake for 9-11 minutes, or until an inserted toothpick comes out clean. 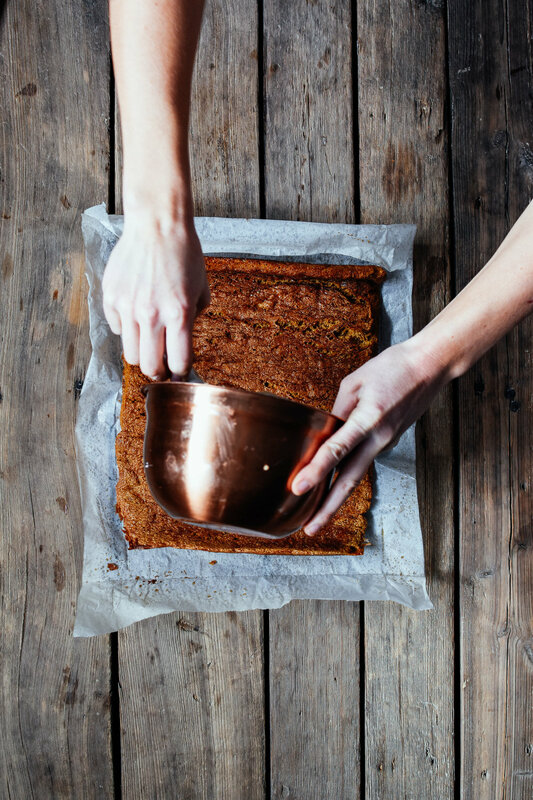 Remove from the oven, and gently slide the cake off of the pan by pulling on the parchment paper. 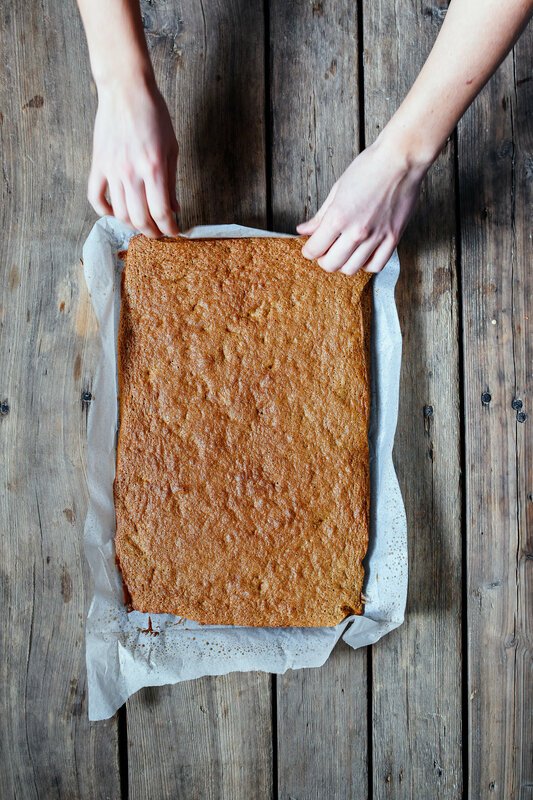 Carefully roll up the cake, with the short side towards you, and place onto a cooling rack. Let the cake cool completely while still rolled up. 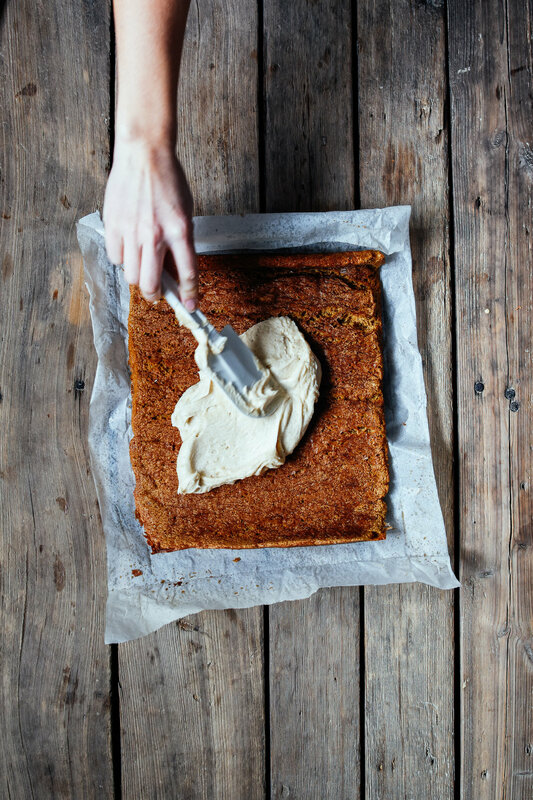 Once the cake is completely cool, frost with the Goat Cheese Brown Butter Frosting (recipe below). Leave about 1⁄2 inch of cake bare on all of the edges, as the frosting will push out a bit when you roll the cake back up. Gently roll the cake back up, wrap tightly with plastic wrap, and place in the fridge to set for at least an hour or two. Letting it sit overnight is great too! Before serving, slice a thin piece off of each end so that you can really see the swirl pattern. Add additional garnishes if desired, and dust with powdered sugar directly before serving. First brown the butter. Place butter into a small saucepan, and heat over medium high. Swirl the pan occasionally as the butter melts. The butter will start to foam, and soon you will smell a nutty aroma. Keep swirling, and cook until you see a bit of brown colour under the foam. Remove from the heat, and cool completely until the butter resolidifies. You may want to place it back into the fridge to speed up this process.